I , Chinmay Gundlur, strongly believe in this notion. I am an experienced content writer with a demonstrated history of working in the Event Management, Design and Experiential Learning Industry also skilled in Non-profit Organizations, Entrepreneurship and Public Speaking with strong media and communication skill sets. 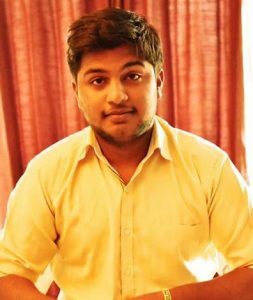 I’m currently a student at the Acharya Institute of Graduate Studies, Bengaluru, pursuing my Bachelors in Psychology, Journalism and English as Majors. While one of my keen interests has been Design and International Relations, I am currently an entrepreneur (Founder, CEO) at Alphaklarex Events and Media Group, Fellow and Trainer Associate for Model UN at Worldview Education (MUNCafé) and also serving the AIGS International Relations Council as its Deputy President and the Cyber Chairman for Rotaract District 3170. While I have bucketed several awards and accolades during school and college time, some of them include the Best Speaker Award at the World Schools Debating Championship, Slovenia (WSDC 2012), participation and mentoring various Model UN Conferences, organising major Youth Fests. I also enjoy travelling and visiting Youth Fests. Whatever I have achieved, I owe a lot of it to Model UN – for me, it has not been an extra-curricular activity; but a life-changing event. 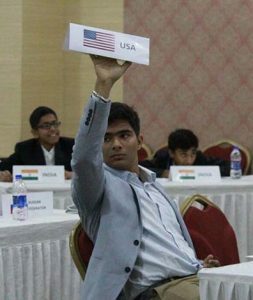 For all those delegates yet to explore the wonder and beauty of Model UN and its scope, just remember one thing that no matter what, when and where; anything and at any-time, something may turn to be a game changer in your life. So roll on your Sleeves, pull up your socks and get ready for some spicy and masala debates here, at the 8th Edition of VHMUN Bengaluru. I feel privileged to be a part of VIBGYOR High Model United Nation and feel extremely delighted to be the Chairperson. Waiting eagerly to witness the power-packed debates from the other side of the table. See you there, delegates! It is my honour to welcome you to the Social, Cultural and Humanitarian Council (SOCHUM) at the 8th edition of VHMUN in the Garden City, Bangalore. Being the co-chair of SOCHUM is a matter of great honour and I pledge to undertake my responsibilities with utmost discipline and sincerity. I started my journey as a delegate with the sixth edition of VHMUN and feel proud to be a part of the Executive Board this time. I am Aryan Mehta and I am currently pursuing A levels at VIBGYOR. I started my journey at MUNs as a delegate just like any first timer; timid and diffident. The propensity to excel and proper guidance have made me a successful delegate. Over the span of two years, I have attended several MUNs but the urge to do better has yet not ebbed. SOCHUM is a committee with a wide mandate, which means that there is a lot to discuss and therefore, I expect all the delegates to toil before the conference to muster as much data as they can. However, the information is of no use until it is delivered effectively in a committee. Thus, I also beseech delegates to actively participate at the conference. There is no need to hold back and every word you say is a step towards becoming a better delegate. As your co-chair, I promise not a moment will be languid and committee will have its share of fun along with fruitful debate, where each of you will be jumping on your seats to be recognised. Forget that this is a “mode”, you are real diplomats of your country and therefore you must keep in mind to propose what your country wants. Feel free to contact me for any queries via mail, and I promise to do my best so that you have one of the best experiences ever.